Photo by–and hand of–Keffy Kehrli. It’s been a rollercoaster of a week. I’m writing this beneath a rainbow banner WordPress has put up to celebrate SCOTUS’ decision to grant equal marriage rights in the US. This week “Madeleine” appeared online in Queers Destroy Science Fiction. People have been telling me, all week, how much it moved them, that it made them cry, that they loved it, and it’s been sustaining me hugely during what has been, on several personal fronts, a really rough time. But then–these last few days. K Tempest Bradford reviews “Madeleine” in her weekly io9 short fiction column and titles it–let’s say, unexpectedly. Some things on personal fronts resolve themselves into utterly unlooked for happiness. My NPR review of Max Gladstone’s wonderful Craft Sequence goes live. And then–I get wind that the Locus Awards are happening and I literally flee the house. Still don’t know what they’re called! — and in so doing I lit up my phone’s lock-screen, which was exploding with congratulatory tweets, and a single text message from my fiancé telling me that I won, that “The Truth About Owls” won. Florence + the Machine’s “Delilah” started playing. Which was interesting because these appear to be opposite reactions but I assure you I somehow synthesised them into glorious, sweaty, mid-run synergy accompanied by a lot of shrieking out to the surrounding corn fields and unflappable cows. Then I ran home and embraced every member of my immediate family because as it happens for the first time in weeks we were all together under the same roof. Congratulations to all the other honourees. I can’t even begin to say how thrilled I was to be on that ballot at all, in the company of Sofia Samatar, Aliette de Bodard and Elizabeth Bear. These women are my heroes. Their work is what I aspire towards. I’m humbled and awed and too grateful for words. Keffy Kehrli (newly of Glittership, check it out!) 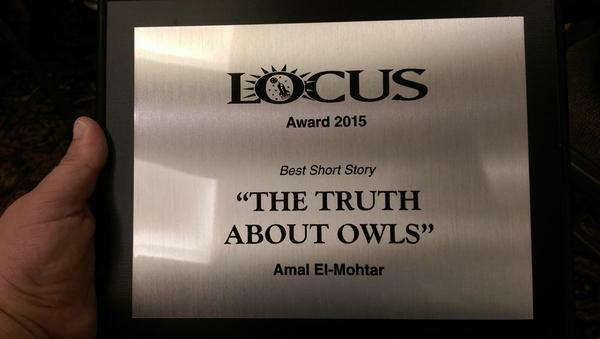 had kindly agreed to accept the award on my behalf in case “The Truth About Owls” should win. I prepared a speech for him to read — written in a state of extreme dubiousness and speculation while trying very hard not to be invested in the outcome I had to imagine in order to write it — and it’s posted below. I’m sitting at home, slowly processing a summer’s evening, trying to imagine the situation where these words will be read out. If they’re being read out, then I won something — the first award I’ve ever received for fiction, for a story that was very hard to write and is very dear to me. I have many people to thank: CSE Cooney, for sitting with me and listening to me blether about structures and Blodeuwedd and Florilegia; Tessa Kum, dear friend and fellow-traveller, for introducing me to the Scottish Owl Centre, that magical place between Glasgow and Edinburgh that I’ve visited often enough to start disconcerting the staff; Alisa Krasnostein and Julia Rios for editing and publishing the beautiful Kaleidoscope anthology and asking me to be part of it — but let me linger here on Julia Rios especially, for her relentless encouragement and insistence that I could write this story while I kept saying I couldn’t. I want also to thank my parents, Leila Ghobril and Oussama El-Mohtar, for loving and raising me with all of their languages; my fiancé, Stu West, for his constant support via the medium of truly terrible puns; Strange Horizons, for reprinting the story and bringing it to a wider audience; and all the good people at Locus, as well as its readers and voters. Awards are splendid things, but they’re really the cherry on the iced cake of knowing people read my story and loved it. The Truth About Owls is that they’re awesome, and so are all of you. Thank you. Part of me thinks, in retrospect, I should’ve talked more about the story, but I had no idea how long it was okay to make Keffy talk on my behalf, and also I figured I’d said everything I had to say either in the story or in this introduction to it. So I’m happy to let it continue to speak for itself. And now I need to topple into bed and figure out how in the world I’m going to get back to normal work in the wake of this. All the thanks my overflowing heart can muster go out to everyone who offered me congratulations and kind words today. You’re wonderful, and your kindness melts me into puddles. For reading, for discussing, for recommending this story, for telling me it moved you — thank you. I just can’t say it enough. This entry was posted in Uncategorized and tagged awards, gif, io9, kaleidoscope, lightspeed, locus, locus award, qdsf, short fiction, squee, strange horizons. Bookmark the permalink. 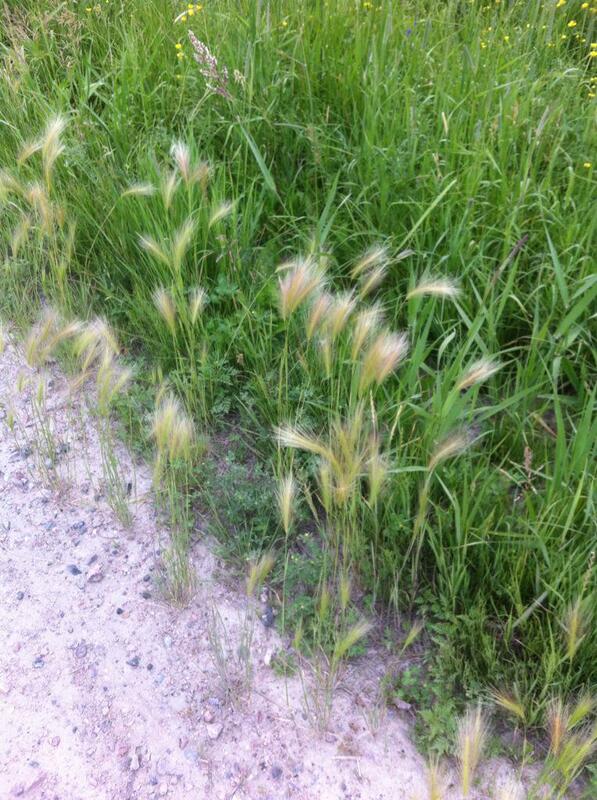 Amal – I’m guessing (semi-educated guess) that grass is foxtail barley. Congrats on your win! Anyway, congratulations to a really wonderful tale, and the prize, of course! Hi Amal, many congratulations on this win! I sent you an email with regard to your wonderful story being translated into Arabic. I don’t know if you still using that email (the one listed in your Writertopia profile). If no longer used, I would really appreciate it if you update me with your current email. Cheers!